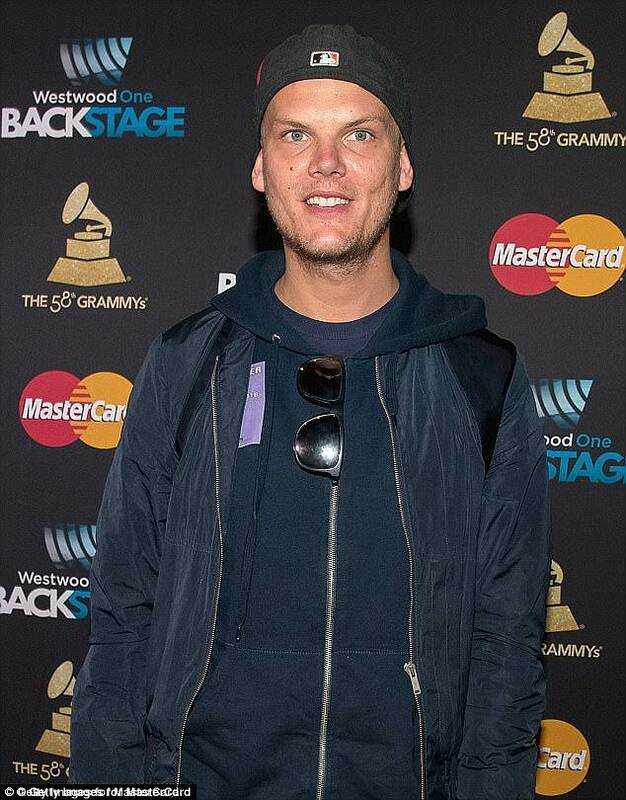 The family of Avicii have thanked his fans for their 'loving' support three days after the superstar DJ passed away in a statement released on Monday. Avicii, who's real name is Tim Bergling, was just 28 when he passed away whilst on holiday in Muscat, Oman, on Friday. Following the sad news of his death on April 20, tributes around the world have poured in for the Le7els hitmaker at concerts and Coachella, ranging from acts like Nick Jonas, Kygo and Tiesto. In their statement, his family thanked his peers and fans for honouring the Swedish musician in the way they had and asked that their privacy be respected in the midst of this difficult time. They wrote: 'We would like to thank you for the support and the loving words about our son and brother. We are so grateful for everyone who loved Tim's music and have precious memories of his songs. 'Thank you for all the initiatives taken to honor Tim, with public gatherings, church bells ringing out his music ... and moments of silence around the world. 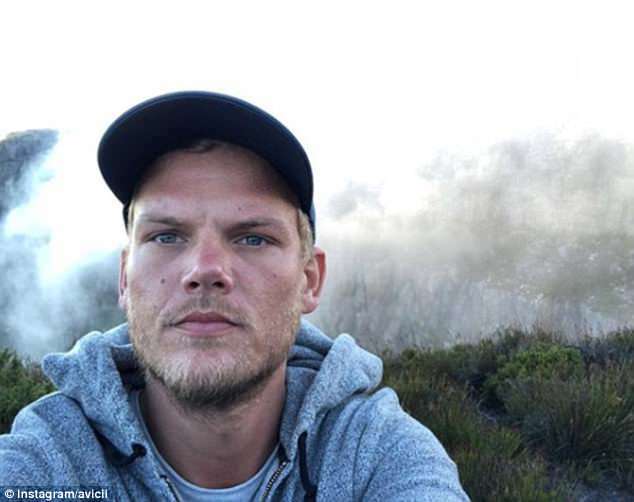 Avicii’s cause of death is still yet to be revealed, but police confirmed over the weekend that autopsies had led to the conclusion that 'there is no criminal suspicion in the death'. The tragic passing of the Hey Brother musician was confirmed in a statement by his publicist. 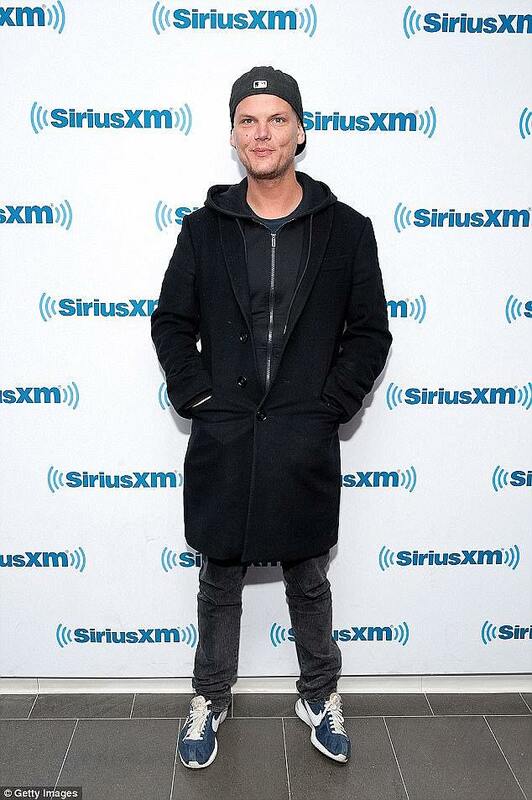 It read: 'It is with profound sorrow that we announce the loss of Tim Bergling, also known as Avicii. He was found dead in Muscat, Oman this Friday afternoon local time, April 20th. 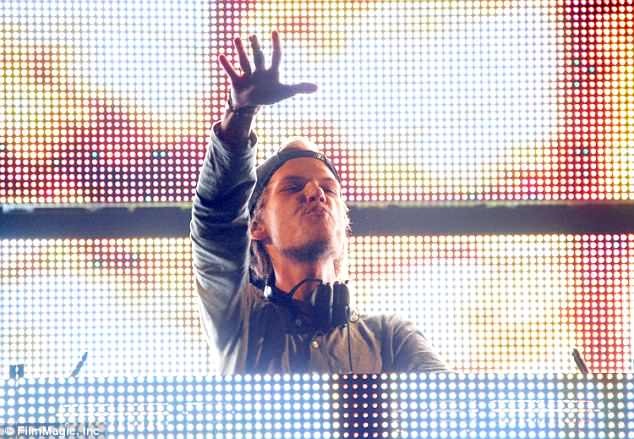 Avicii had been open about his health issues in the past and had previously retired from touring. He had been battling with acute pancreatitis - which is a potentially life-threatening inflammation of the pancreas - due in part to excessive drinking, and had his gallbladder and appendix removed in 2014. It has been reported that his friends feared that alcoholism would kill him and those nearest to him were becoming increasingly worried about him in the months leading up to his death, according to TMZ. In the wake of his sudden death. 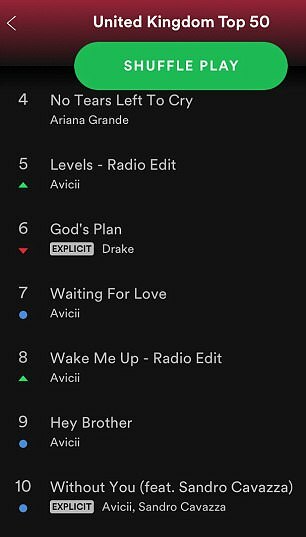 Avicii has stormed the Spotify charts as fans remember his greatest hits. Open: Avicii had been open about his health issues in the past and had previously retired from touringThe electronic musician passed away in Muscat, Oman, on April 20 while on holiday, sparking an outpouring of grief among his admirers and fellow artists. 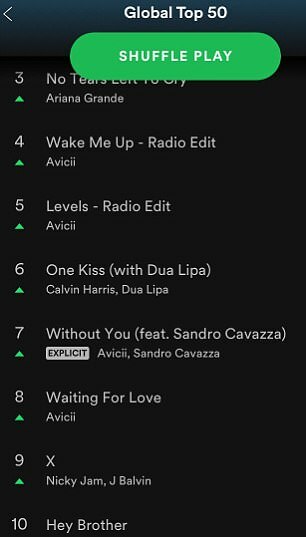 Now the world-famous Swedish DJ, whose real name is Tim Bergling, has dominated the Spotify charts, with an incredible 10 tracks in the top 50 global chart. He nabbed double that number in Sweden's top 50 list, boasting an astonishing nine songs in the top 10 positions. And five of the top ten songs on the UK Top 50 chart today are Avicii hits. 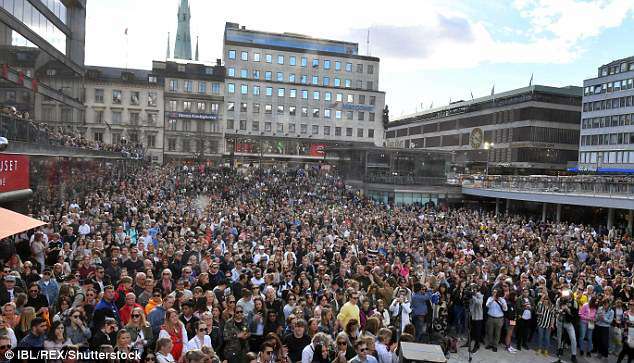 Meanwhile, hundreds of his fans gathered in Stockholm to remember his musical legacy. Avicii was no stranger to Spotify success, with his hit Wake Me Up being the most played track of 2014. In 2017, an average of 17.7 million users tuned into his tracks on the site every month.The talented musician was reportedly close to finishing an album when he died. Avicii was a pioneer of the contemporary Electronic Dance Music and a rare DJ capable of worldwide arena tour. He was part of the wave of DJ-producers, like David Guetta, Calvin Harris and Swedish House Mafia, who became lead performers in their own right. Known for Wake Me Up! The Days, You Make Me, and the recent Lonely Together with Rita Ora, Avicii's biggest hit was Levels. 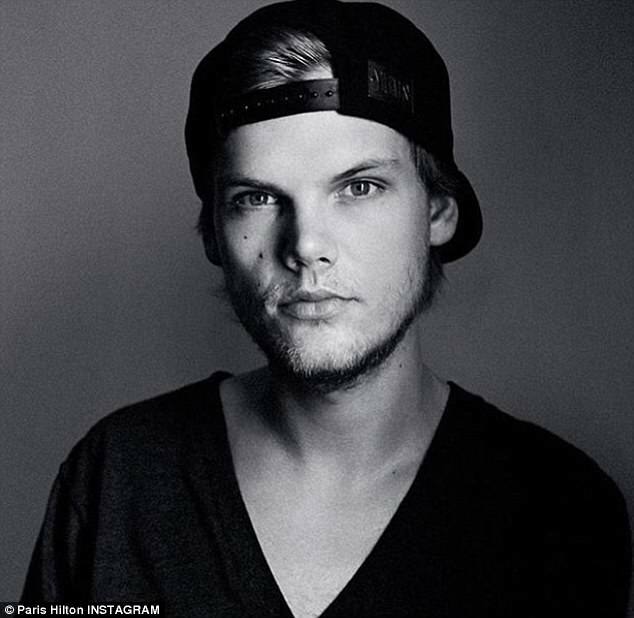 His death came just days after he was nominated for a Billboard Music Award for top dance/electronic album for his EP Avicii (01), which he released last August. 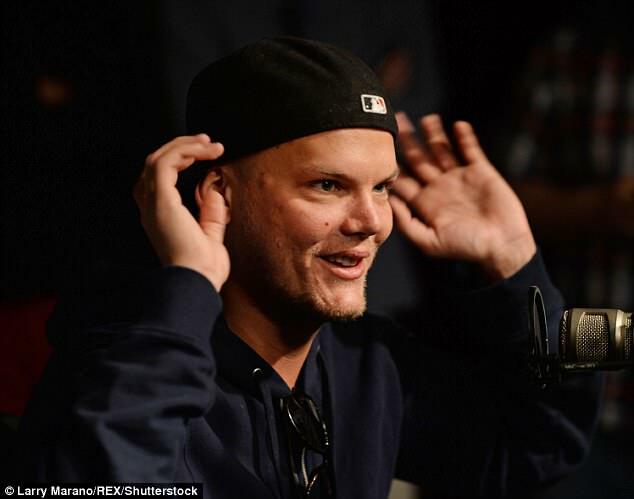 Avicii struggled with addiction in the past and was hospitalised twice for alcohol-related issues. He suffered from acute pancreatitis and had to have his gallbladder and appendix removed in 2014. The DJ quit touring in 2016 in order to focus on his health and recovery. In November 2017, footage was released of the musician hospital-ridden in Australia while struggling with his health during his worldwide arena tour. Authorities in Oman have said his death is not being treated as suspicious. Police have said his body will be flown to his native Sweden this week. 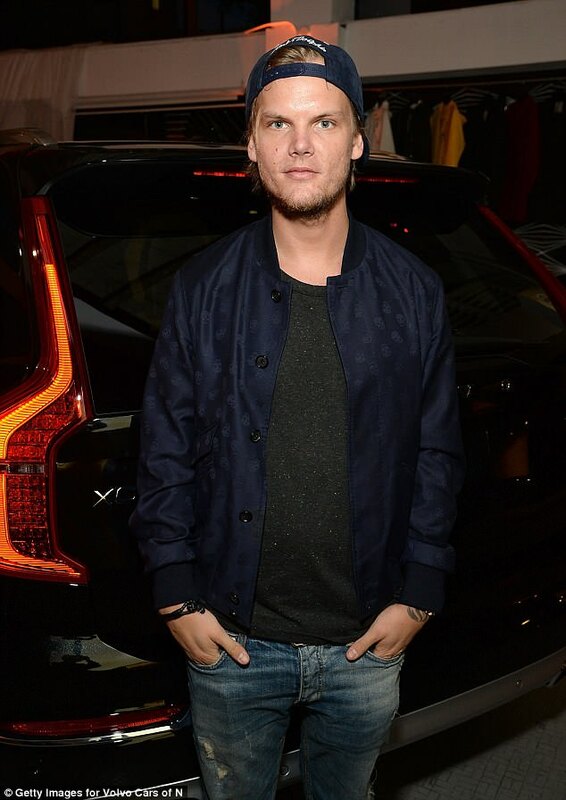 Avicii’s brother, David Bergling, had reportedly traveled to Muscat to find out more about his sibling’s death. The musician was seen just days ago while posing with fans at the luxury Muscat Hills Resort - which are thought to be some of the last photos of him alive. Fellow producer Calvin Harris was one of the first to tweet after his death, writing: 'Devastating news about Avicii. He scored his first UK number one in February 2013 alongside Dutch DJ Nicky Romero with I Could Be The One. The track, which features uncredited vocals from Swedish singer Noonie Bao, also topped the charts in Hungary and entered the top ten in Australia, Belgium, Denmark, Finland, Norway and Ireland. Avicii had to fight his way into the mainstream. In 2011 X Factor winner Leona Lewis and her record label, Syco, had to settle a legal dispute with the DJ after he claimed they used an instrumental that was a direct copy of his own song, Fade Into Darkness. Collide was eventually released as a collaboration between Lewis and Avicii which skyrocketed his career and scored a number four in the charts. 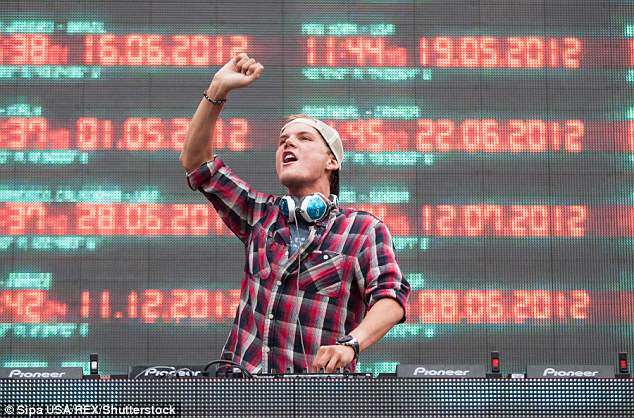 Taken from his hugely successful debut album, True, Wake Me Up saw Avicii pick up his second number one in the UK charts. The track – featuring Aloe Blacc's vocals – was the lead single for the album and became a 2013 summer anthem. Also taken from True, Lay Me Down saw Avicii team up with Nile Rodgers and Adam Lambert. Rodgers lends his songwriting and guitar backing skills while Lambert – who performed the single during his own solo tour – is on vocals. Again off True, Hey Brother was an instant commercial success. American bluegrass singer Dan Tyminski lends his vocals for the track which came from Avicii offering his brother advice. An official music video released in 2013 saw two brothers growing up in wartime America, with the older brother dying in the Vietnam war.